Augusto Pinochet’s CIA-backed coup against Salvador Allende: Chile’s 9/11 anniversary still divides the country. Before the 2001 terrorist attacks, Chile experienced its own Sept. 11 tragedy. 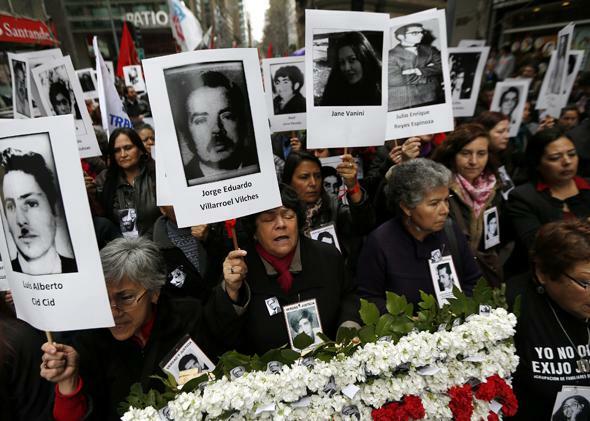 Forty years later, Chileans are still divided over the legacy of that day. Wednesday marks the 40th anniversary of the coup d’etat in Chile that ushered in a 17-year dictatorship under Pinochet. Demonstrators hold up images of their relatives during a rally in Santiago Sept. 11, 2013. As Americans remember Sept. 11, 2001 with video montages, scattered candlelight vigils, and an avalanche of #neverforget Facebook and Twitter posts, Chileans are remembering a different 9/11—Sept. 11, 1973, the day a CIA-backed military coup ousted a democratically elected president with a right-wing strongman. Tensions in the South American country have been rising for weeks in anticipation of the 40th anniversary of the morning in 1973 that Chile’s military, with the secret support of the United States, flew fighter jets over Santiago and bombed its own presidential palace. Within hours, Chilean President Salvador Allende—Latin America’s first popularly elected socialist president—was dead. He was replaced by Gen. Augusto Pinochet, whose regime killed, tortured, and exiled tens of thousands of Chileans. For the next 17 years, Chileans lived under an economically prosperous dictatorship that showed little regard for human rights. Each year, peaceful demonstrations commemorating the coup devolve into violent riots. Last year, the protests resulted in the death of a police officer and the injury of 20 more; some 255 protesters were arrested. This year’s demonstrations were widely anticipated to be the largest ever—and possibly the most violent—because of the 40th-anniversary milestone, new revelations about the old regime, and the lead-up to a remarkably dramatic presidential election in November. As of early Wednesday morning, one bus had been bombed, five cars had been torched, 10 neighborhoods had been barricaded, and 13 arrests had been made. Seven high schools were closed for the day because their students had occupied them in honor of the anniversary. Shortly after noon, news station Radio BioBio reported that hooded protesters and police had begun clashing at a university in Valparaiso, and police had responded with tear gas and water cannons. Students were told to leave the university. Santiago felt quieter than usual early on Wednesday; traffic was lighter and fewer pedestrians choked the normally hectic downtown streets. Many workplaces encouraged their employees to stay home for the day. The U.S. Embassy asked American citizens to avoid the demonstrations, and a crime-tracking organization released a map that pinpointed the areas most likely to have clashes. One cabbie said he was calling it a day after he’d heard that five vehicles had been attacked. Another said he was heading home because there were so few fares. Hundreds of people gathered throughout the day at the General Cemetery, where Allende is buried, along with hundreds of nameless victims of the regime. Others gathered at the National Congress, located in Valparaiso, or on university campuses. Families of the coup’s victims were planning an evening march to the Estadio Nacional, which served as an ad hoc death camp immediately after the coup. It was there that folk hero and musician Victor Jara had his hands chopped off, and was later killed. One memorial took place at 11:50 a.m. in front of the presidential palace, 40 years to the minute after Chilean air force jets opened fire on the building. Hundreds of people gathered at the rebuilt palace in front of a statue of Allende, singing folk songs, chanting, and laying bouquets of red carnations at the feet of the former leader’s likeness. Among them was Faviola Reyes Manriquez, who said her brother was assassinated by the regime in 1982. Her family still wants justice for his death. Chile is still profoundly divided over the Pinochet era: While a majority of Chileans look back on the repressive rule with bitterness, a significant minority believes Pinochet’s rule was necessary to end the stunning poverty that eclipsed the nation during Allende’s rule. President Richard Nixon, worried that more countries would follow Chile’s example and elect socialists, had placed sanctions on the country, quietly ordering the CIA to “make the economy scream.” Forty years later, Chile is the second strongest economy in South America after Brazil. For years after Pinochet was peacefully removed from power in 1990, Chileans seemed eager to forget the past and move on. But the nation seems to be shedding its reticence about its past. Earlier this year, leaders of one of Santiago’s wealthiest neighborhoods voted to change the name of its principal boulevard from Avenida 11 de Septiembre—a name bestowed by the dictatorship in 1980—back to its original name. In recent weeks, every nightly news station has been showing footage from the coup. Across the country there have been plays, documentaries, book readings, and art exhibits about the coup—as well as a flood of new political graffiti and murals in a city that is already covered in them. Public figures are also speaking up: Last week, Chile’s National Association of Judges made an unprecedented apology for abandoning its role as a protector of basic rights during Pinochet’s rule, asking for the forgiveness of both the victims “and of Chilean society.” Chile’s current president, right-wing billionaire Sebastián Piñera has made a call for anyone with information on “the disappeared” to come forward. The divide over Chile’s past is bizarrely underscored by the unlikely personal history of the two leading candidates in this year’s presidential race: former president Michelle Bachelet, a socialist, and the right-wing candidate Evelyn Matthei. The two middle-aged women were childhood playmates in the 1960s, when their fathers were military pilots at the same air force base. The men each rose to the rank of general, but during the 1973 coup Bachelet’s father stayed loyal to Allende, while Gen. Matthei allied with Pinochet. Gen. Bachelet was arrested after the coup and was tortured to death in a military school operated by Gen. Matthei. Decades later, the generals’ daughters find themselves running against each other for president. Though the women claim they retain no animosity toward each other, many Chileans consider the women’s entwined history to be a reflection of the country’s past. The dynamic is tense: On Monday, Matthei paid her respects at the government’s official commemoration, which Bachelet refused to attend, saying she couldn’t stomach memorializing the coup in a room “full of passive accomplices.”Reyes Manriquez noted that it is not usually the families of the victims that cause trouble for the police; often, it is young people who have no direct memory of the dictatorship. “The families have lived through enough violence,” she said.